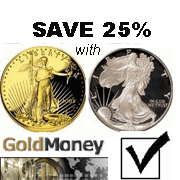 Make gold and silver, right alongside your regular dollar-earnings! It's the right thing and the prudent thing to do in these uncertain economic times.It's easy - and it's free. Set up a GoldMoney or Pecunix account. In case of a GoldMoney account, get verified under their “CAP” (Customer Acceptance Policy) so you can buy and spend gold grams from your account. Set up your GoldMoney or Pecunix online merchant shopping cart or payment interface according to their respective instructions (takes only minutes). Set up a page on your website (we will provide the content) that tells your customers why it is important to accumulate gold in these difficult times, and how it can benefit them to own gold in addition to being able to pay you in gold to get the discounts. The only somewhat time consuming part of these steps is getting “CAP” verified in the case of GoldMoney. Yet, all it requires is that you fill out a couple of forms and get a copy of your driver license or passport authenticated by a notary public or an attorney. Once you have everything ready, you need to mail the package to GoldMoney’s offshore office on the British Isle of Jersey. Attorneys who handle immigration matters use a special stamp to verify that copies of documents corresponds to the original. That is the fastest way to do it. It usually costs under ten dollars. Other types of notary public are unfamiliar with this procedure and sometimes decline to perform it. Now you are ready to earn gold or silver, passively, with no further time involvement other than answering a few of your customers’ questions. The important thing to remember is that the absolute worst thing that could happen to you and your bottom line as a result of accepting gold or silver in payment for your goods or services is - nothing! If no customer takes advantage of your offer, you lose nothing. They still pay you in dollars, just as before. If they do pay you in precious metals, just keep it. Ask your accountant how to account for any capital gains taxes that might apply. He or she will know. The best part of all this is: If and when the dollar finally breaks down, you will likely own a stash of PM’s that will lend your business stability. At the same time, many of your customers may then own enough PM’s to get them through the hard times - and they will still be able to buy from you. There is no time to waste. Start earning gold and silver now!